Saeward didn’t even recognize her at first: the timid, freckle-​faced young woman who’d come to his door in a plain gown and a carelessly braided rope of hair. She might have been a maid. It was the sight of the Queen’s dog behind her that provided the essential clue—and then his jaw dropped. The Queen tipped to the side to peer past him into the room. “Hallo, sweetie!” she called, waving her fingers at Jorunn. She leaned so far that Saeward felt obliged to step aside, and she took that as an invitation to come right in. Left alone in the corridor, the Queen’s dog wagged her tail at him. 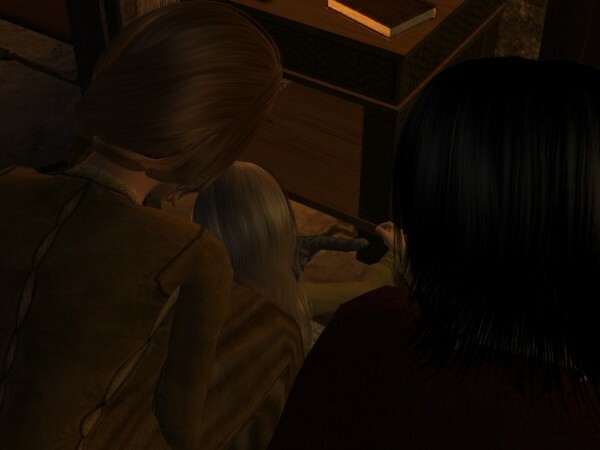 Saeward ran his hands through his hair, took a deep breath, and turned back into the room. The room in which Sigefrith Hwala’s young wife was now standing. The Queen hitched up her skirts and sat on the edge of Saeward’s bed. Saeward winced and looked at the ceiling. Sigefrith was directly overhead, creaking around in his office as he did every night until quite late. Saeward took a few steps into the room. 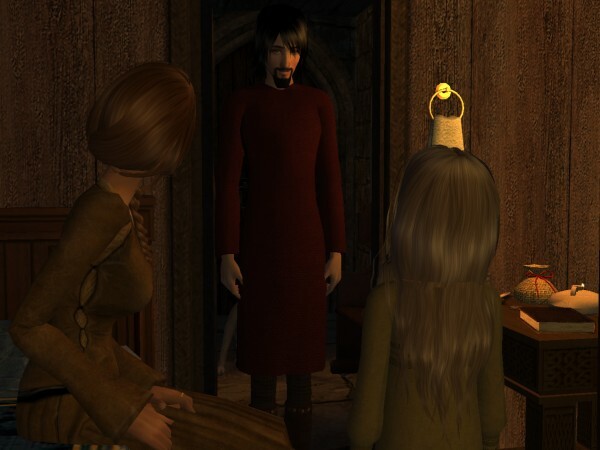 He was careful to leave the door wide open, and anyway Jorunn was there, and the Queen had brought her dog… and Hell, why not count the cat as a chaperone while he was at it? “Did we ever!” Saeward answered for her. Jorunn gave him a timid smile. Earlier he’d even gotten down on the floor and joined in the play. It had helped put off the moment when he would have to start figuring out what he was going to do. “How many kittens do you have?” the Queen asked. She subtly turned the question aside to Saeward, and he noticed it and was grateful for it, because it took some of the pressure off the poor, uncomprehending girl. “Five,” he answered. “Fimm ketlingr,” he added for Jorunn’s benefit, holding up five fingers to be sure. Most of his Norse vocabulary currently consisted of the activities and anatomy of kittens. Oh, no. Saeward looked down at the little bed he’d made out of folded blankets and a pile of pillows. The kittens had already plowed through the pile, and one of them appeared to be wriggling between the layers of blankets. Littlefoot padded out of the corner, looking over the unusually large assembly of humans with a skeptical eye. She meowed a question at Saeward, sounding rather like she wanted to know how many more females were expected to invade the room she suffered him to share with her. But she rubbed her flank along his ankle all the same. Jorunn followed after Littlefoot, reaching out to give her a caress. Saeward had to dodge out of her way, and in his narrow room, he was all but obliged to sit down if he didn’t want to step on any of the kittens that might have been worming through Jorunn’s blankets. He could sit in the chair, and be down low, at an awkward angle, and far away from his guest, or he could sit on the bed. With the door open, he decided it was safe to to sit on the bed. Still, he was careful to leave a good person-​width on either side. They both looked at Jorunn, who was playing with Littlefoot and paying them no mind. Saeward wondered what a twenty-​year-​old Jorunn would want to come back and tell herself tonight. What would she wish he had done? He ran his hands through his hair and propped his elbows on his knees, overwhelmed by the weight of mistakes he hadn’t even made yet. “I would have been grateful for a cat,” the Queen said softly. “Kattar-​mothir,” he said, and Jorunn glanced back at him, smiling. He put one foot on a flat spot on the blankets, stood up far enough to grab the parchment on the table, and thumped back onto the bed again. 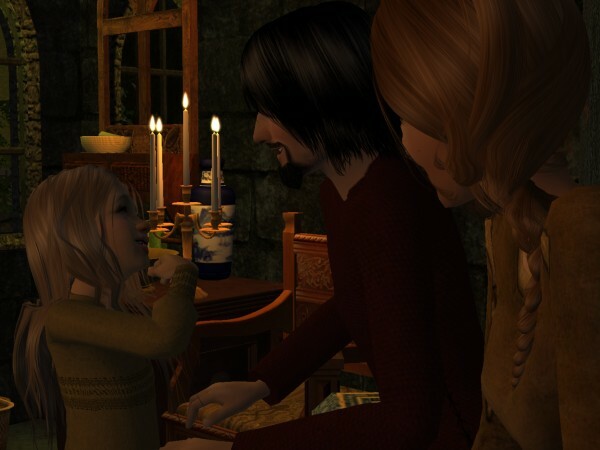 At the very end, unasked, Brede had put “I love you.” Saeward had decided he would learn Norse by working his way down. Saeward sighed and laid the parchment on the mattress beside him. He’d known this was coming. And the last thing he wanted anywhere near his bed was Sigefrith’s grateful wife! Nor did he deserve it. A man didn’t deserve praise for rushing into a life-​altering decision without thinking. Now, if just one person were to ask him, “Are you sure about this?” he would probably break down and say, “No, I don’t know what came over me, please take her away!” Even if his gut ached every time he imagined the look in Jorunn’s eyes. “I do,” she said, glowing over his acknowledgment and kicking her dangling feet against the bed frame like a girl. Saeward wondered idly whether Sigefrith ever let his young wife win an argument. “Oh, Hell! What was I thinking?” Saeward vaulted off the bed as if there were no time to lose. Jorunn ducked, Littlefoot meowed, and Saeward grabbed both knives and hurried to hide them on the top shelf of the wardrobe. It only took a few seconds, but afterwards he had to lean his forehead against the wardrobe door, trying to calm himself. His blood pounded in his ears to the cadence of I can’t do this, I can’t do this. He was not fit to raise a child. In his world, children cut other people with knives. And he had just frightened Jorunn, if not the Queen. Saeward lifted an eyebrow and turned his head to look at her. Her face was bright pink. “As Sigefrith would say,” she added sheepishly. She laughed, and Saeward granted her one half of a smile. Even so, he paused to study her more closely. She was damnably nervous, but she wasn’t looking up at the ceiling, and she wasn’t starting at every noise out in the court. He decided she was so shy that she hadn’t even noticed the impropriety of her visit. She needed all her concentration to converse with a man she scarcely knew. Saeward grunted and thought for a moment. Impropriety notwithstanding, as long as she was here, he could get some advice. When, he wondered, had “I” turned into “We”? Jorunn looked around, having guessed by the tone of voice that she was being addressed. But she remained on the floor with the cat. Saeward snorted. He didn’t doubt that in the least. Her voice was so low and earnest that Saeward was confused and even worried. He hadn’t accidentally given Jorunn herself away, had he? She looked up at him. There was such raw longing on her face that Saeward clapped his mouth shut a moment too late. “What did you hear?” she asked. That was true enough, though he supposed the fondness and regret was more for their poor beloved Queen than for the day-​old infant scarcely anyone had seen. “Does Sigefrith ever speak of her?” she asked. Her voice broke, and her eyes filled with tears. By now Saeward had made up his mind: he definitely wanted to pull out his hair. What was it about Sigefrith Hwala’s womenfolk? Had he instructed them to hound him? Saeward would not have been surprised. “Of course he does,” he replied. But that didn’t get him off the hook. “What does he say?” she whispered. A tear ran down her cheek. Was a reeve supposed to offer a handkerchief to a queen? Was he allowed? 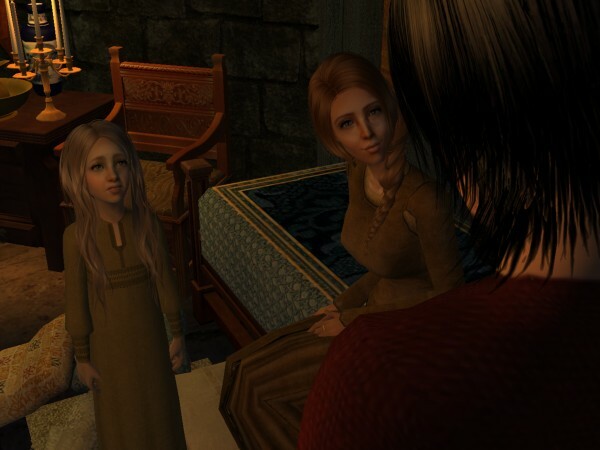 Meanwhile Jorunn got up and turned to them, her little face drawn with worry. Saeward absently put a hand out to her while he tried to think of something to tell the Queen. To his astonishment, Jorunn padded closer. 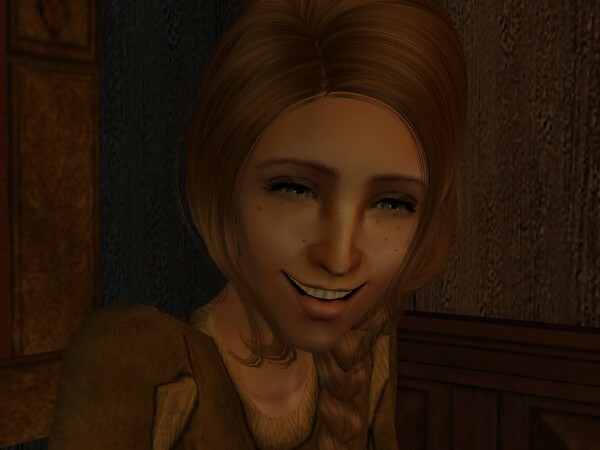 The Queen broke into a teary smile and whispered, “He counts her.” Then she turned her smile up towards the ceiling, and Saeward saw she’d been aware of Sigefrith’s presence all along. 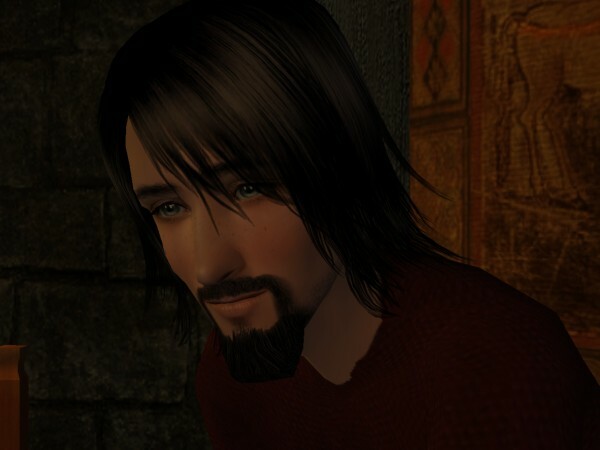 Just then Saeward felt a couple of sharp tugs on his sleeve, and he turned back to Jorunn, flustered. He’d never had to deal much with females, apart from getting his business done between their legs, and now he had to handle two at once. The earnestness of her face hinted at a busy mind behind it. For a heartbeat Saeward thought she was about to say something… in front of a witness this time. Instead she opened her mouth wide, pinched one of her top teeth between her fingertips, and wiggled it. Saeward was baffled. But the Queen understood. “You are beginning to sound like a new father! She will be fine.” The Queen was swinging her feet again, and her girlish insouciance reassured him more than any words. 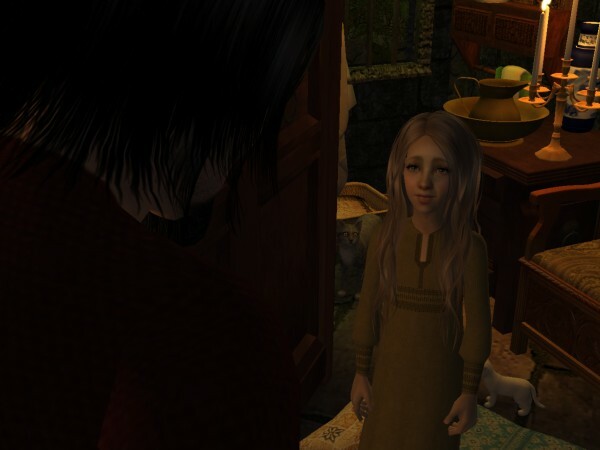 Saeward cupped her little face between his hands. Inside he was a queasy, confusing mix of proud and flattered and terrified. Jorunn’s grave expression was unreadable, but she didn’t pull away. For long seconds they remained nose-​to-​nose and eye-​to-​eye. Say something, he pleaded. A bird lit on the stone sill outside and twittered in the twilight. Saeward let go. Was that all that intense little stare meant? That she was tired? Oh, no. Saeward squeezed his eyes shut. “Don’t you know any stories?” the Queen asked. Saeward was a calloused liar, but this one pierced even him to the quick: this slap to the faces of his father and mother, who had taught him to recite that most sacred prayer, the Shema Yisrael, from the cradle. For the first few weeks of his exile, he’d even gone on praying it without them, shivering over the words in barns and sheds, trying to warm himself over the ashes of his old life. One morning he’d awoken so cold and hungry that he hadn’t bothered. And he’d never said it again, not even when he was waiting to be hanged. He couldn’t start again now. Saeward’s immediate concern was not being obliged to say it right then. If he wasn’t praying his own prayers, he wasn’t about to start praying the Christians’. The Queen tucked a lock of hair behind her ear and went on kicking her feet. She took a while to answer, and Saeward worried that he had asked too much after all. Strange, considering she would probably have kept Jorunn for herself if she could. “Not officially, of course,” she added weakly, blushing at her audacity. Saeward wanted to ask her what her husband would think. Hell, he didn’t know what he thought himself. Since he’d come to Lothere, his life had already become so thoroughly entangled with Sigefrith’s that he didn’t know how he would break free of him. Not that he’d ever truly been free of him. Meanwhile, though, this little girl needed more than a place to sleep, new dresses, and food. He was going to make a wreck of things if he tried to do this alone. He didn’t even know how to care for a child’s hair. I think Saeward will be better at the whole dad thing than it sounds like he fears. And now he knows he has Eadie to help with things. It’s an unlikely alliance, but I think they could make quite a team. 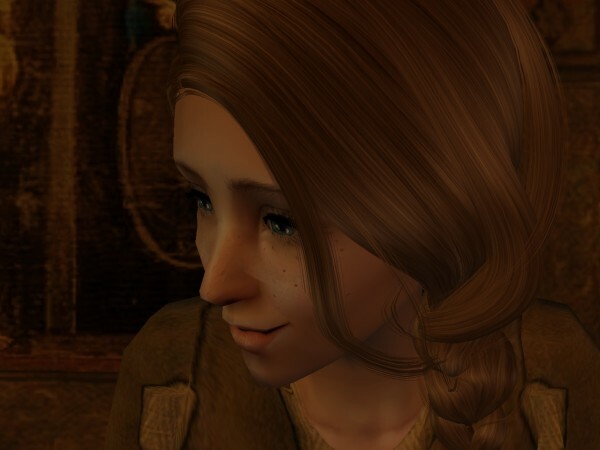 I hope Eadie gets the daughter she wants eventually, but I also hope that she doesn’t stop doting over Jorunn if she does. Not that I think she would, but just for the record. That last picture is so darling. I was a bit concerned about this at first, but I think it will turn out just fine! You know, the fact that Saeward sees this visit as Sigefrith’s women all coming after him says to me that he has Emma on the brain. I think somebody made an impression! “What do you mean, I’m responsible for the amount of luster that this kid’s head is giving off?! ?” It is to lol. I can only take Saeward’s insecurity as a good sign. He so wants to do what is right and good and best and not hurt nobody no way no how. And what is all this business about Saeward being on the gallows? —I’ll take “Bone-​ified” for 100, Alec. —Alright and here’s the clue: If closets were in wide use in 1086, this is what the Lothere’s reeve would keep in his. AENGRUA! LASGUS! What were we calling them??? Is it just me or have the last two chapters had sort of suggestive titles? Oak-​A, I am going to stop stalking Lothere starting… now. Hmm very interesting chapter. Saeward trying to adjust to his new role as a father. And Eadie wanting for a daughter.. Motherhood is a beautiful thing some women revel in it. Looking back at Lothere there were women like Lena, Sela, Lili, and Elfleda who were robbed of many years of motherhood. Speaking of mothers I hope my Aia is doing well underground with her baby’s daddy. Oh my goodness. The ADORKABLENESS! It KILLS! I don’t know, Morgaine. Ralf might be perfect. I have a cat. I have to feed it, clean its poop, carry it around on my shoulder to stop it from wailing in my face, get it immunized, brush its hair and hire a sitter when I am away from home (err, for more than 24 hours). Not to mention the number that it does on my furniture. PARENTHOOD. This chapter was…revealing. I feel like finally managed to put a label to the vibes Saeward gives off when we get his POV. And I think it explains why Jorunn likes him. Despite all the darkness he’s been through, and all the nasty scars it’s left on him (anyone remember how he was considering how easy it’d be to strangle Emma? ), he’s still predominantly the wounded child who’s lost his world. Like a child, he sees things in black and white. And like a lost child, he’s still feeling his way around the edges of this world. Jorunn’s much the same. Also. Is anyone else getting slight Egelric/​Iylaine flashbacks? 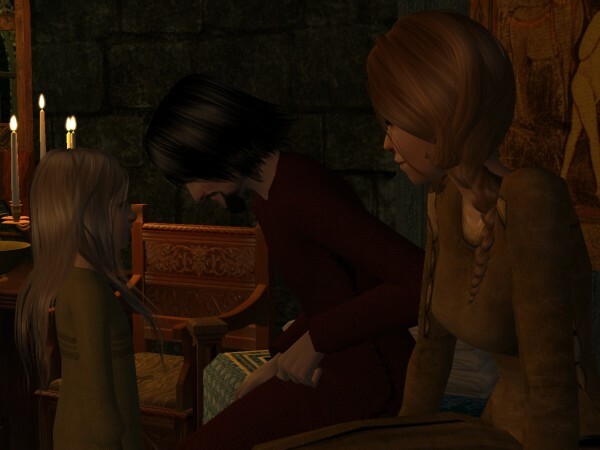 I mentioned in a a few chapters before how much Saeward and Jorunn remind me of the old days of Egelric and Iylaine. 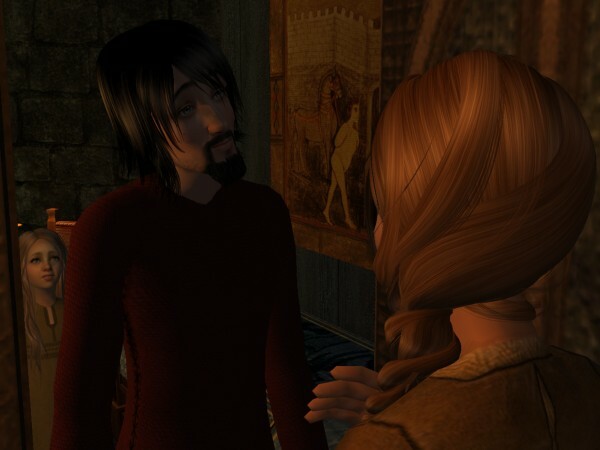 Situationally speaking, it’s reminiscent of Egelric and Iylaine but seeing as how Saeward and Jorunn are such different people from Egelric and Iylaine, it can’t possibly turn out exactly the same way, right? Right?? Hm. Situationally isn’t a word, is it? Yes, I am not too worried that it will turn into a total Egelraine numero 2. I just don’t want to rehash the same archetypes in the same way. Silent, tortured man gets his heart reawakened and his soul redeemed by an orphaned blonde waif with a tragic past, yadda yadda. George Eliot staked her tent on that ground already. 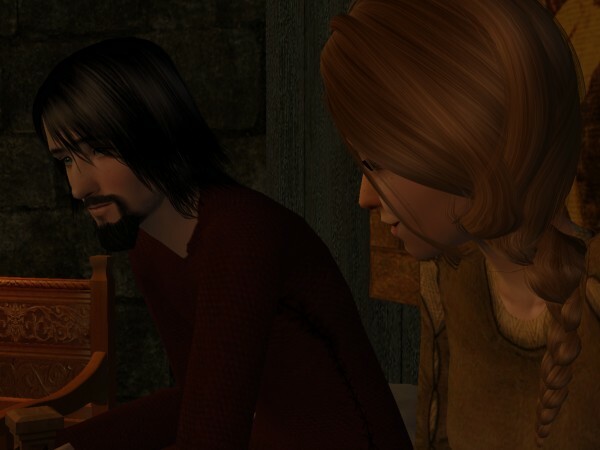 Egelric and Iylaine have already subverted that pattern nicely, in fact, by making such a mess of their lives. I suppose it’s Jorward who stand the greater chance of Silas Marnification. Good thing Saeward has all those skeletons hidden away, instead of boring old gold! I wonder how much honesty he’s going to allow her as she gets older. Will Saeward open his metaphorical closet or will their relationship be strained by the weight of his creepy mysterious creepitude? Coming soon to a computer screen in front of my face. Aw. Brede always comes across as rather decent and even wonderful in other characters’ chapters. Then you hit one of his own and he’s a total mess. Seiza, that quote stood out to me too. “Where have you been?” Her mother had always warned her that this was among the phrases one did not speak to a man if one wished to have a happy marriage.